After doing a little work on the duck club cleaning out the ditch for water and creating a small excavation area in a very skeptical place I was very pleased to go down there a week later and see this. 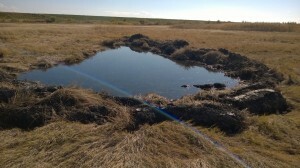 The water actually filled up the small pond and should make for a decent late season duck shooting spot. That water leaves the pond and spreads to the West where we need it most. A couple of boxes out that way are where I like to hunt ducks later in the season, there is also a chance for a goose on occasion. Well, keeping an eye on the main lake water level as it normally begins to rise this time of year, I noticed it looked like it had risen quite a bit in just a few days. Suddenly a light went off in my head. 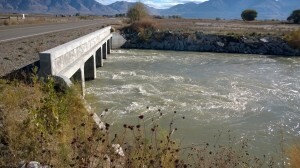 It seemed like they were going to be doing some work on the Cutler Dam in Cache County sometime this Fall. Could it be that they are starting that work now? If they are, that would explain why the lake level has risen so much in the last few days. I had to go and investigate and yesterday was a perfect day for that to happen. 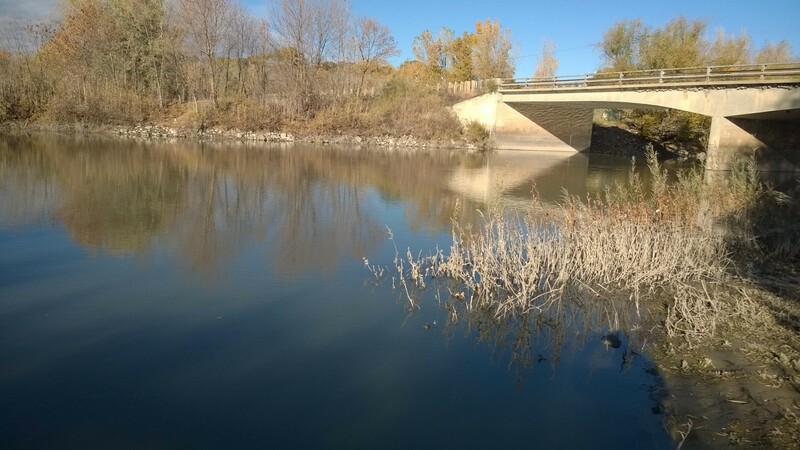 The notice is warning boaters and hunters that a drawdown was going to take place and to be dang careful when venturing out. You could get stranded in mud should you take your boat and hunting party out. I have to say, they gave plenty of notice as these signs were at every boat ramp on the lake. 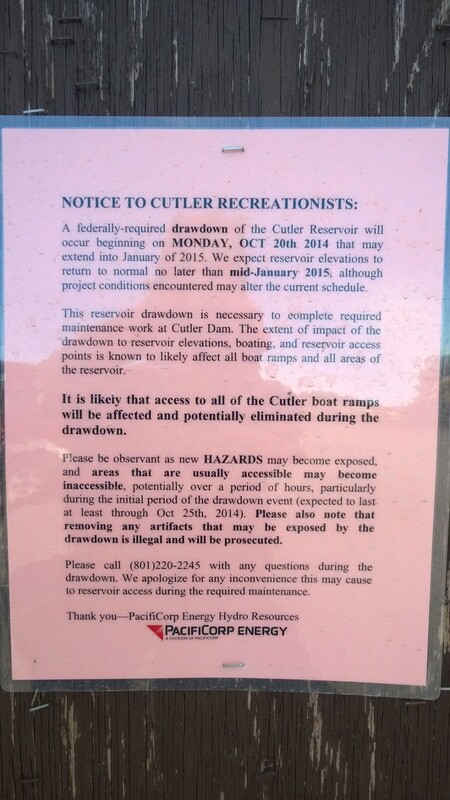 It says the drawdown would begin on or about Oct. 27th…..Heck that was this past Monday. 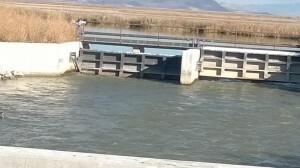 That is when I noticed the water in the Great Salt Lake was up considerably. They must have gotten a hair in their butts to begin the draw down earlier. Along the shoreline at this boat ramp you can see just how much the water level has dropped. 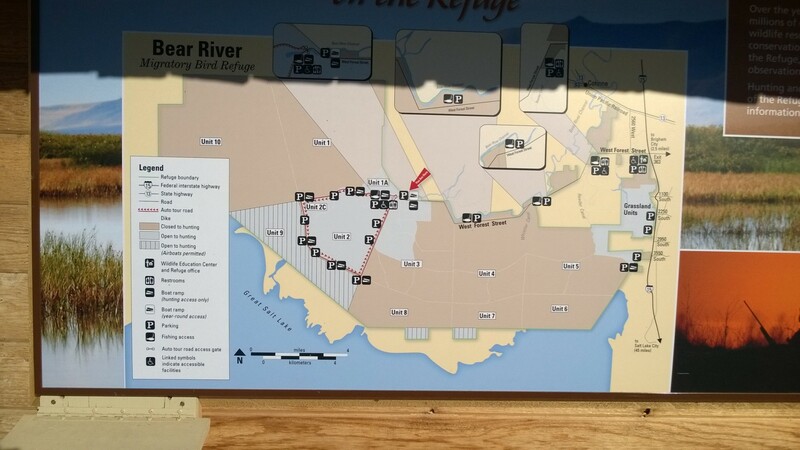 Well, since I have to go back home anyway, I figured I might as well go back by way of a trip out to the Bear River Migratory Refuge, heck it’s only about 30 miles out of my way. Besides, you guys need to know what is going on too. Heading toward Tremonton, I stopped at a little out of the way boat ramp I know about to see what the river looked like at that point. The river was running high, but not overly high at this point. 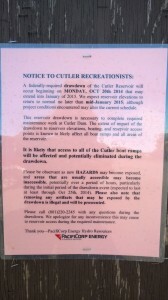 But again, it’s obvious they are pouring a good deal of water out of Cutler Reservoir still. I hiked over and under the bridge to get this next picture. 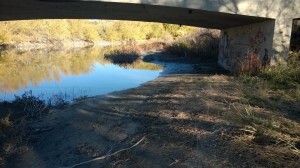 You can see from the wet mud along the shore the water had been a good 3 feet deeper at one point recently. So, the main draw down must have been quite a show and it would have been fun to have witnessed it, but that is “water under the bridge” so to speak. 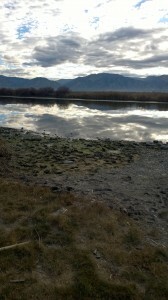 Now my curiosity is centered down river at the end the Bear River Migratory Bird Refuge. This refuge used to be the largest migratory bird refuge in the nation back in its day, it covers a whole lot of ground and is being managed pretty good. Only about a third of the total property is open to hunting, the rest is left available to the migratory birds that flock through here. Of course it is a great place for the birds to rest on their flights South in the Fall. Our duck club is on the fringe of the South East corner of the refuge. 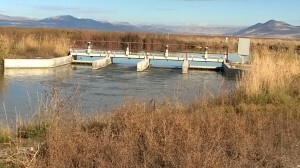 The refuge is broken up into nine different “units” and each of the units has its own water course and control valves. 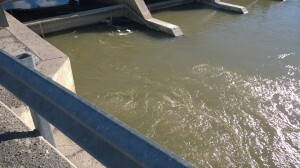 My interest is on those control valves and where they are sending the water that is coming down river from Cutler dam. 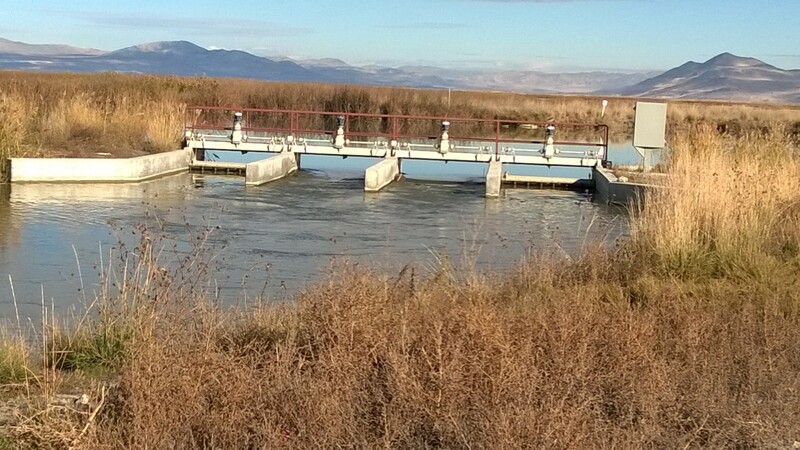 Unit number 5 is the main unit that feeds the Great Salt Lake near our duck club and of course this is where I would like to see the manager send all the water, but of course I’m biased. As I travel West out of Brigham City, down what is known as Forest Street, when you get just past Interstate 15, you pass the Bear River Migratory Bird Refuge Visitor Center. I didn’t bother stopping there as I still had quite a bit of traveling to do and my “honey do” list back home still had to be completed. As I approached the “Reeder Canal”, which carries the water into Unit 5, I was very pleased to see this flow going into it. That is a lot of water! I don’t think the canal could carry much more than that amount. So, my wish to have a lot of water going into Unit 5 is being done! YEAAAA!!!!!! 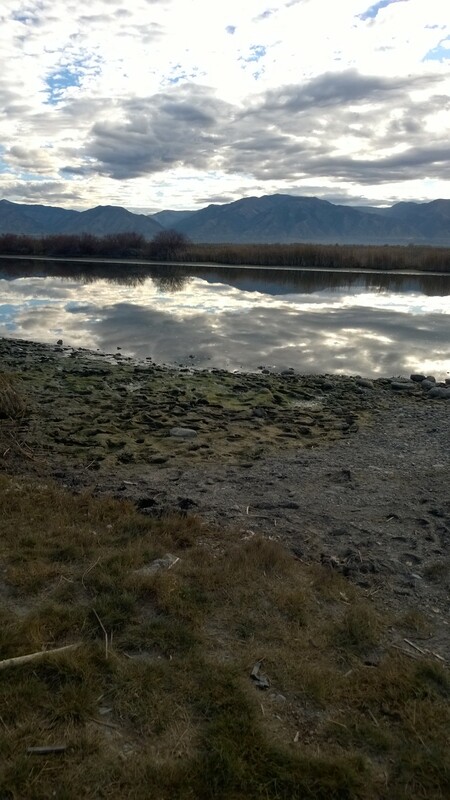 This would explain why the level of the water in the Great Salt Lake has risen so quickly. When Unit 5 gets full, there are only a couple of outlets and both of them dump into the “Willard Spur” of the Great Salt Lake. 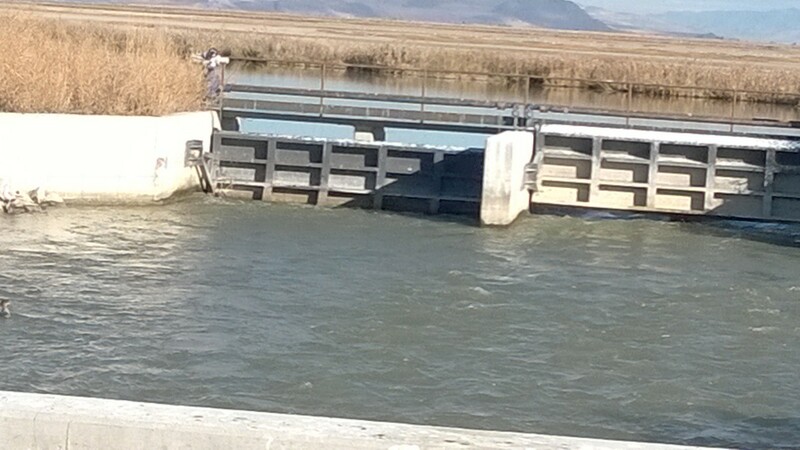 It takes a lot of water to fill the spur before it begins to empty into the Great Salt Lake proper. 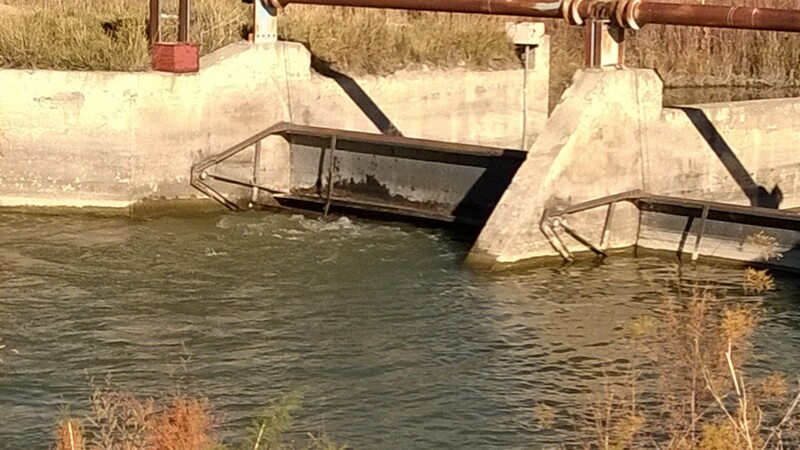 By the time the spur fills the water is lapping at our duck clubs’ Western boundary! Perfect for late season hunting! Down the river I stopped at each of the other spillways and recorded the water going out of the river. This series of pictures clearly shows they are dumping a lot of water into the various units and each unit in turn is dumping the over flow into the Great Salt Lake! Every duck hunter in the northern end of the state should be over joyed with this. While I was out there, they have a road where tourists and hunters can drive around what is known as Unit 2. 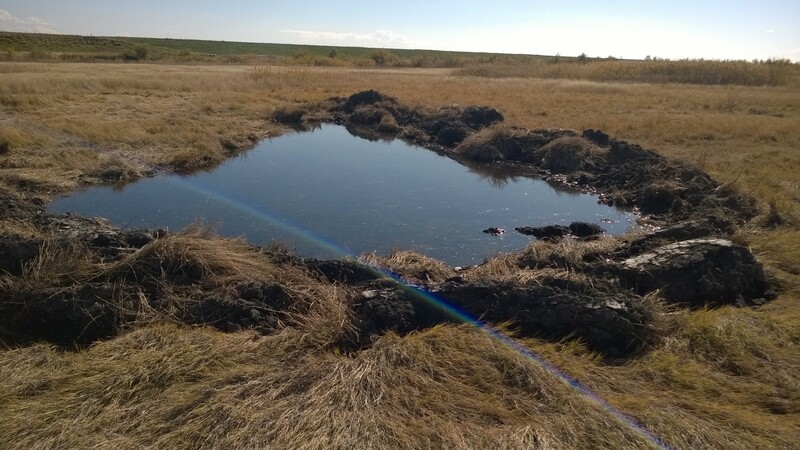 A lot of hunters utilize this unit to bag tons of ducks, geese and for the few lucky ones with swan tags, they take a lot of Tundra or “Whistling” swans from this unit. A special regulation is in effect for any hunter on Unit 2, and that is, if you are hunting within 50 yards of the center of the dike extending into the unit, you are only allowed to carry 10 loaded shotshells with you. The problem that was created before this rule went into effect was what is known as “sky busting”. Hunters would stand on the dike and shoot at any bird that flew past, whether that bird was in range or not. So to limit the amount of sky busting, they put the 10 shell limit on the hunters. Of course if you have a boat and set up farther than 50 yards from the dike, that rule doesn’t apply. As I drove around Unit 2 I could see out in Unit 1 to the North, a LOT of birds. Big birds, small birds, dark birds and white birds. Hundreds of swans, thousands of geese and a grundle of ducks. Unit 2 contained a few Red heads and a scattering of Pintails, but mostly coots…..THOUSANDS AND THOUSANDS of coots….coots everywere! Coots on top of Coots. Continuing around, the South end of Unit 3 (un-huntable area) was loaded with good big ducks. A few coots as well, but mostly Mallards, Pintails, Spoonbills, Widgeon and Teal. I didn’t see any geese on Unit 3. Even up in the “huntable” area of Unit 3 there were a lot of good ducks. That area is almost impossible to get into unless you have a boat (of course for those of you who think you can walk on water, good luck crossing the channel…it’s very full of water….see pictures above), but for those who do have a boat, the hunting would be fantastic! Even on a day like yesterday, blue bird! After I got back home and cleaned up the Honey-Do list, I got hold of Bob and we went down to the club to look things over. It was getting late in the afternoon and we talked to some young hunters just heading out for an evening shoot. They said they were getting quite a few ducks way out. We allowed them to foot travel through the club and on out to their hunting place. In the meantime we drove Bob’s Rhino out to Baddley Box. The water that is pouring into our club from the sewer plant is not yet down there, which was very surprising to both of us, however, further travel out toward Colmer Island, found us stopping way short as the water level of the lake is up and completely surrounding that spot. YESSSSS!!!! It’s time for a hunt folks! 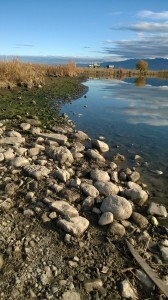 We had our hip boots on and waded out to Colmer Island. The box needs some repair work and that will have to be done when someone goes out hunting. There isn’t any way you will be able to hunt there without fixing it up. Sorry…work before play! So, there you have the story! I’m excited to think it is time to hunt and I can’t help but believe we have some Northern birds sitting on the Refuge right now. It can only get better until things freeze up! 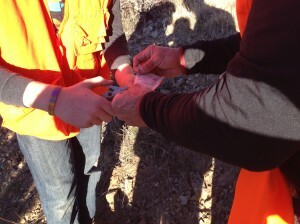 Grab your shotguns, load up on shells, Don’t forget your HIP number and your duck stamp! A couple of decoys, the call, warm clothing, a thermos of coffee and a sandwich….everything else is a luxury….oh ya, a 5 gallon bucket! I found this picture and recipe on “www.fromforesttofork.com” I thought it so well written I just had to share it here and for tonights supper, guess what we are having? For you cavemen, here are the ingredients and the directions. 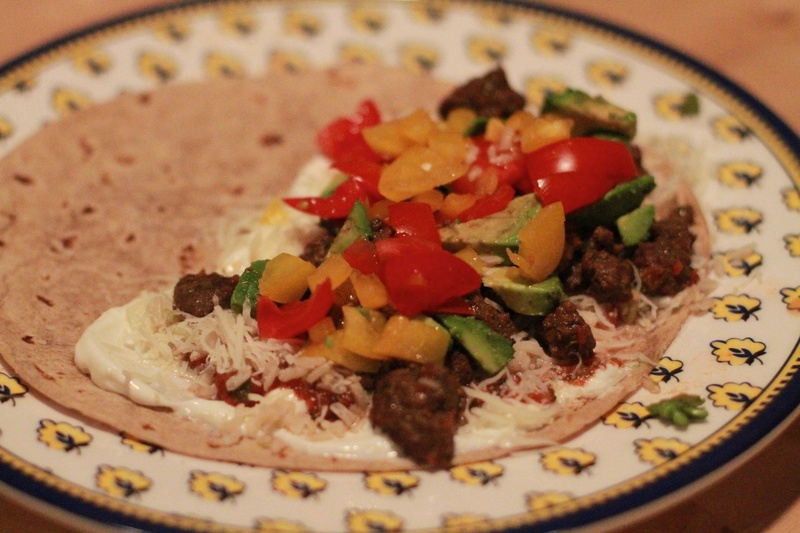 Cooked ground elk or wild game – if you have ground game sausage, use that! 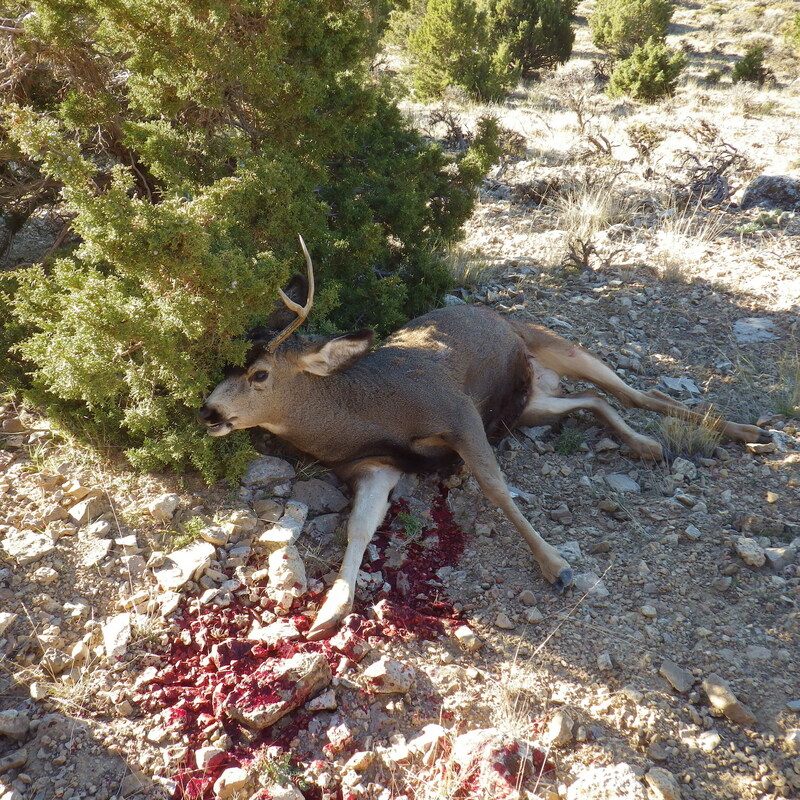 CAUTION: THIS STORY HAS A VERY GRAPHIC PICTURE OF A DEAD ANIMAL IN IT….I’VE WARNED YOU. As big game hunters we all wish we could see a sight like this painting by Rusty Phelps. 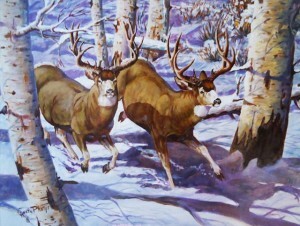 Two record book mule deer bucks running past our position on the mountain. Both well within our shootable range and both equally heavily horned. But in reality, if you as a hunter spend your lifetime out in the woods as often as is legally possible, you MIGHT get so see a sight like this once and I’ll almost guarantee you the deer of this quality you see will be much farther away from you than you can easily and ethically shoot. But that doesn’t mean your trophy of a lifetime has to be of the caliber that you see in this painting. 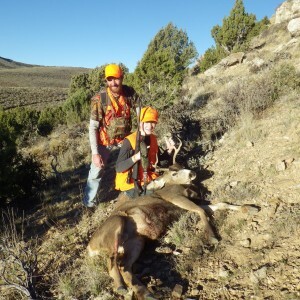 Yesterday I told you about going out hunting with Weasel and Conner on what was Conner’s last day to hunt mule deer this year. We had no idea what to expect as we have not been hunting during the Utah Any Weapon hunt for about 35 years. Of course we expected to see quite a few hunters out on the mountain, but still, we didn’t know what to expect in the way of deer. 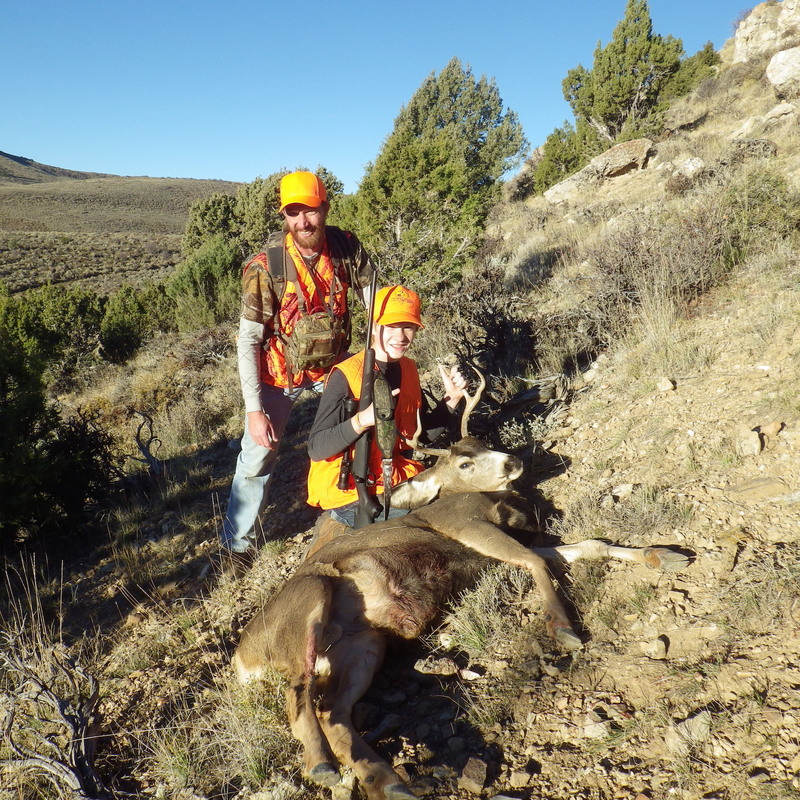 After a bow hunt, a muzzleloader hunt and seven days of the any weapon hunt, it is quite possible for the deer that are out there to be hidden well back into the remotest and steepest areas of the mountains. 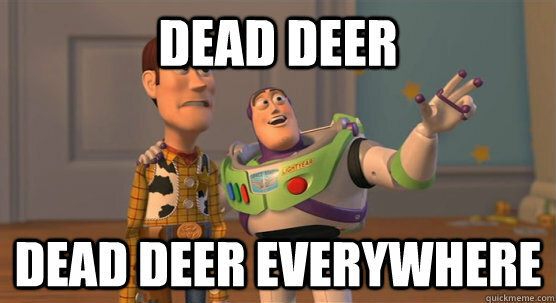 Would we even see so much as a doe? We didn’t know, but wanted to be out there anyway for one last chance. I had to dig deep to find my blaze orange hat and vest. Blaze orange anything for me is not something I desire to be wearing, but it is the law and so we had to have it. I even dug up some for Conner to wear. Weasel had to go to town and buy his own. The alarm went off sharply at 3:30 a.m. and I quickly planted my feet on the floor, knowing full well if I laid there for any amount of time after the alarm went off, I’d fall back to sleep and miss the hunt. I didn’t want to miss this hunt. At about 5:05, Weasel and Conner were in my driveway and we quickly tossed my pack and gear into it for the two hour ride to the mountains. That ride allowed us to see a raccoon and a porcupine and 3 deer all along side the road and luckily nothing tried to cross our path. Well, the raccoon made the dash, but wasn’t hit, dang it. We saw something “orangeish” fleeting into the brush on the side of the road….fox? Cougar? We will never know. At first light we were exactly where we wanted to be and we began our slow crawl up the mountain in four wheel drive looking for deer. 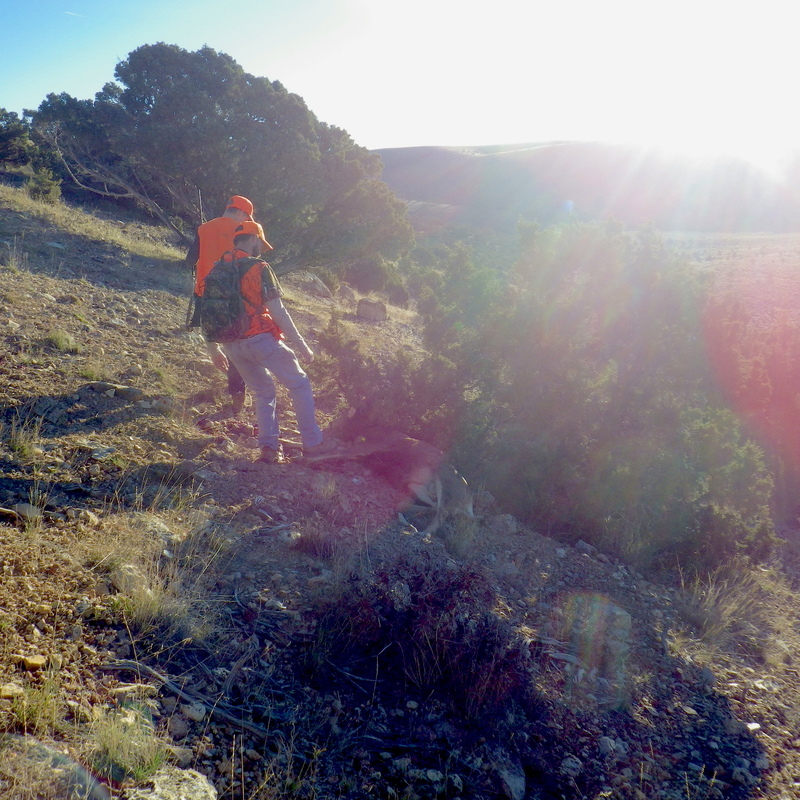 We saw a lot of other hunters camps along the way….many more than we were accustomed to seeing, but as for hunters, they were either still in bed, or were out at their favorite hunting spot as we did not see a hunter anywhere on the mountain. Having not gone more than a half a mile up the road we saw our first deer of the day…a doe and a fawn. That was very encouraging. It wasn’t more than a few hundred yards more and we saw two more of the same type. Four deer within less than 15 minutes of travel. This was going to be a great day. As we continued up the road we saw more deer, soon the count was at 13, but none of them were bucks. Suddenly as we began a decent down a very rough and rocky dugway, we saw a calf moose. Where is momma? It is unusual to see a calf of this size without momma around close by. Perhaps she was down by a small pond of water ahead of us….we didn’t see her, but the calf turned and ran off down the hill to our left and out of sight. Continuing ever so slowly over the roughness of the road, we eventually came off the dugway and were on a typical clay based mountain road that showed all the signs of being very ugly and nasty during the last rain storm (recall our muzzleload hunt that just ended). The road was dry and not any issue for traveling on. At a fork in the road, we chose to go right and up the bottom of a wide valley. About a half mile later, Weasel, who was driving, spotted what he thought was a moose about 300 yards ahead. He tried to point it out to Conner and I so we could see it through our binoculars too, but he wasn’t able to get us pinned onto it before it went behind some cedar trees. He said it was very dark and as we were trying to pick it up in our binocs, he changed his mind from it being a moose to it definitely was a deer. He caught a quick glance at it as it moved between two cedars and disappeared again…..”I think I saw horns, but I’m not really sure”…. Again, with binocs down, he was able to tell us which cedars the animal went behind. It was more than the 300 yards ahead where I was looking and so we decided to drive closer and keep our eyes peeled on the spot. The group of cedars were only about 4 or 5 trees in size, all very close to one another, but there was plenty of space around them that if there was a deer trying to escape we would be able to see it. When we were straight across from the small grove of trees, we stopped the truck, got out and began glassing. Did the animal lay down in that grove? I instructed Conner to take his rifle off his shoulder, as he had placed the sling over it when he got out. I also told him to get his shooting sticks ready to place the rifle on it should the deer come out and indeed be a buck. At that moment, the deer came out and there was no need to place binoculars on it to see the antlers! Conner has not been afforded the opportunity to shoot this rifle much and was having quite a difficult time getting the bolt back in order to put a shell in the chamber. After a bit of frustration he realized he was not pulling the bolt high enough before trying to slide it back, and it didn’t take him long to have a shell properly placed in its firing position. He was already sitting on his backside and had the rifle on the shooting sticks when he slid the safety off. He went immediately to the scope and picked up the moving deer through it. The deer was nearly 180 yards out when Weasel and I both let out a whistle! The buck stopped and looked down at us! 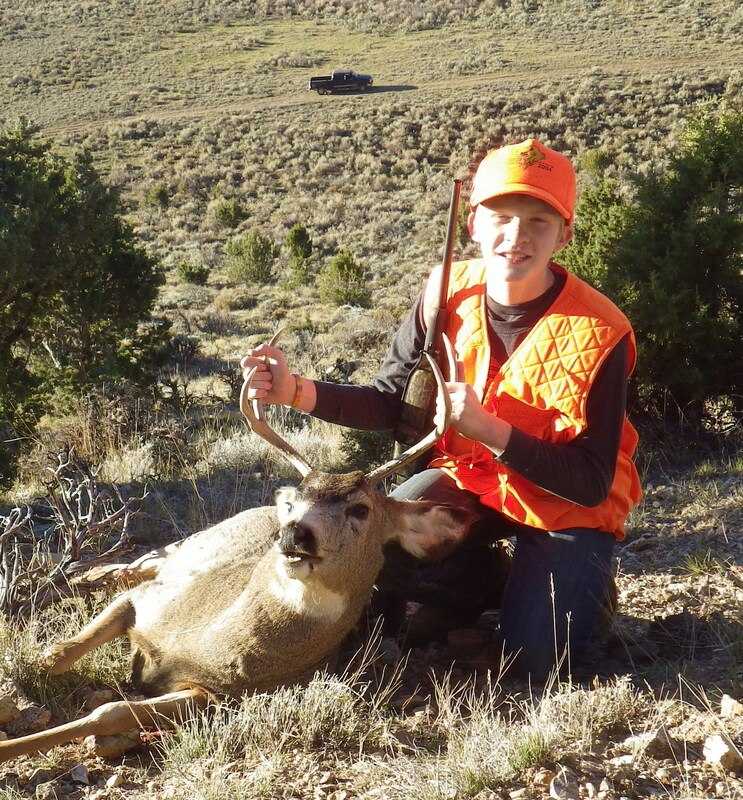 That was all the time Conner needed, as he placed the cross hairs on the deers shoulder and touched off the round! At the report of the rifle, there was an almost immediate POP, as the bullet slammed home and the buck fell in its tracks, dieing almost instantly! As Conner’s Grandpa, I was astonished to think my 13 year old Grandson had just put his first buck on the ground! And not just any buck, a very respectable buck! 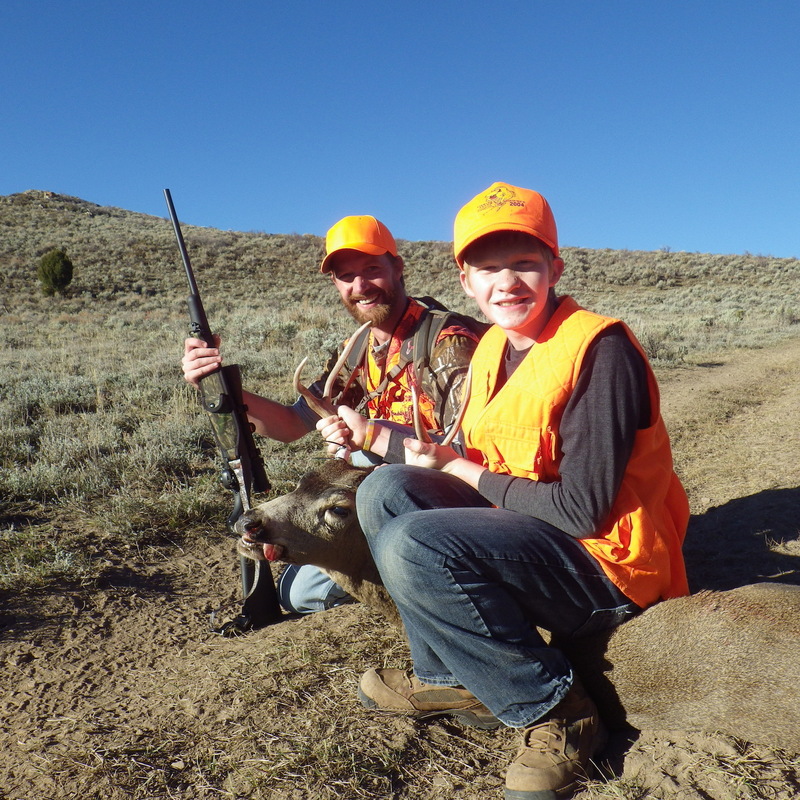 Conner put another round in the chamber and the rifle on safe, as Weasel and I studied the now still body of the deer laying on the mountain side. We continued to view it through our binoculars for over a minute and the body did not move. We knew then the deer had for certain expired and there would be no need for a follow up shot. High fives were flying around as the three of us were very excited about what had just happened. Conner was experiencing a little bit of “after the shot jitters” and his legs were sort of, let’s say, “wobbly”. After a couple minutes to gather the items we knew we would need to get the animal cleaned out and back down to the truck, we started our slow climb up to it. We had to remain cautious, as it may not be as dead as we thought it was. Conner took the lead, as he had the rifle. We went slowly toward it with full intent of coming either down onto the animal or at the very least across the hill to it. A wounded animal will most certainly take a man out if it is approached from below. As an old guy (65) and out of shape, the steepness of the hill (as can be seen in this photo) made me very glad we were going slow. We kept a vigilant eye on the animal as we climbed. Soon, we found ourselves above it and Weasel slowly went up to it and touched it with his foot. Conner made a perfect shot and the animal did not know what hit it. The bullet did everything a bullet is designed to do, penetrate, cause damage and kill as quickly as possible! You can see from the blood on the ground it did just that! Looking at the antlers on this buck, we were all a bit surprised to see the size of them when we got up to the animal. From nearly 200 yards away we could see the antlers without binoculars, but there is almost always “ground shrinkage” when you walk up to your downed animal….this time it was quite the opposite! Weasel decided that we should drag the animal down the hill to an area with a bit less slope to it before he removed the entrails. When we got to a better, less sloping spot, we decided to take some photos to record the event. As Weasel went to cleaning the animal, Conner and I watched and held onto a leg or two. When that was done, Conner had to do one last thing before we moved the buck….notch his tag! When the work of cleaning was all done and the tag attached, the drag down to the truck was a pretty easy one and of course more pictures had to be taken when we were back to the truck. What a great day for all of us! On the ride home, we decided to take the time and process it and get it into the freezer, there would be no better time. We were finished with the cutting, wrapping and grinding of the burger and all cleaned up by 6:30….just in time for the big world series game! Way to go Conner! Congratulations on a very fine first buck! Well there won’t be a Boobin Baby Board today, but it should be a great day to be out in the field, as Weasel, Conner and I are heading out to see if Conner can’t fill his tag. For us it is the last day of the general rifle season and the end of the 2014 hunting season. Can we find a buck for Conner? Only time will tell. 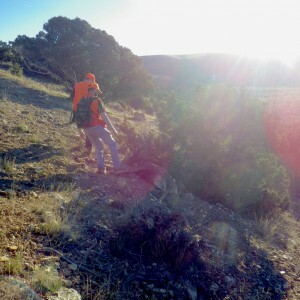 We have our honey hole to go and check out and hope to be there at first light. The hundreds of thousands of hunters with blaze orange have been out hitting the hills since a week ago today and we have seen some very nice bucks being taken state wide. But we only need one to show up and be close enough for Conner to get a shot….hopefully under 200 yards. He is shooting his dads 243 and should be able to knock one down with that. We aren’t hoping for a monster buck, just a legal one. Wish us luck! One proposal would allow limited entry deer hunting on six general season units, after the general rifle buck deer hunt on the units is over. You’d be required to use a muzzleloader during the late-season hunt. Rifles would not be allowed. Only a small number of permits would be available. Shannon says the hunt would run Oct. 28 to Nov. 5, the same days the general muzzleloader elk hunt is held. Hunting would be allowed only on units that are managed for 18 to 20 bucks per 100 does and that are exceeding their buck-to-doe objective. 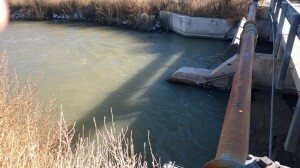 The six units that currently meet the criteria are Chalk Creek/East Canyon/Morgan-South Rich (Unit 4/5/6) and Kamas (Unit 7) in northern Utah; Nine Mile (Unit 11) in east-central Utah; and Southwest Desert (Unit 20), Zion (Unit 29) and Pine Valley (Unit 30) in southwestern Utah. Another proposal would allow a small number of hunters to hunt all three seasons — archery, muzzleloader and rifle — on the limited entry or premium limited entry deer unit for which they drew a permit. 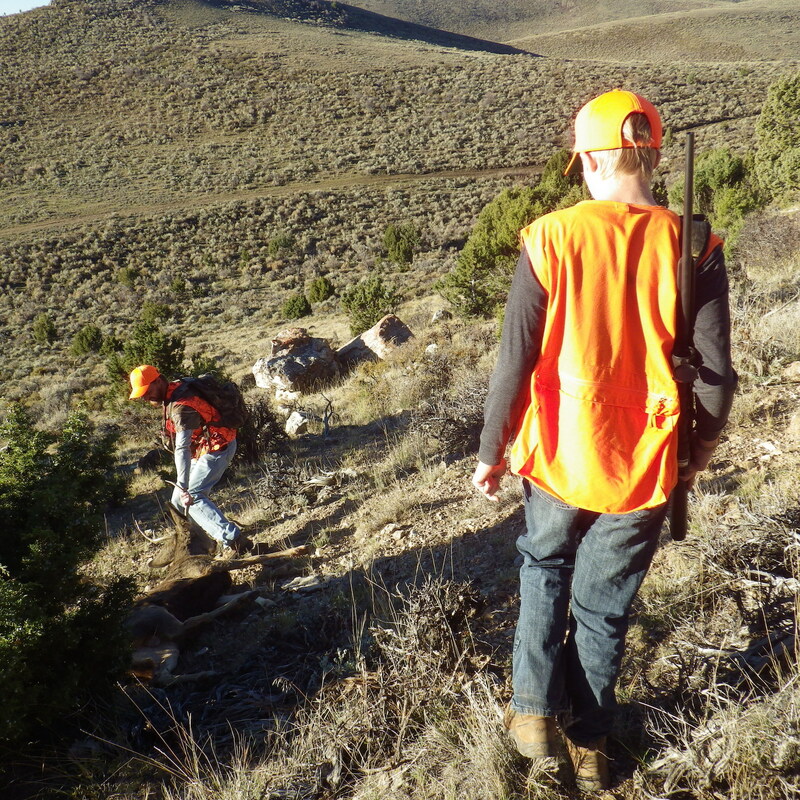 Utah currently offers an opportunity like this to a small number of elk and black bear hunters. “We’d like to give a few deer hunters that same chance,” Shannon says. About three percent of the total number of limited entry and premium limited entry deer permits would give hunters this opportunity. Limited entry muzzleloader elk hunters would have three more days to hunt under another DWR proposal. Biologists are proposing that the limited entry muzzleloader elk hunt run from Sept. 21 to Oct. 2. Mountain goat hunters would also have more time afield. Currently, Utah’s once-in-a-lifetime mountain goat hunt ends in mid-October on most units. Biologists would like to extend the season as late as mid or late November on some units. To lessen the number of deer that are living in urban areas in Cache County, the DWR is recommending an archery-only urban deer hunt. The hunt would happen mostly on private land in an area that includes the towns of Clarkston, Trenton, Wellsville and Mendon. The hunt would run Sept. 12–Nov. 30. Folks, I’m not intentionally leaving out other committee members, I just thought the 4 of you could represent my thoughts in the Northern Region RAC meeting. I just read where it is proposed to create another limited entry muzzle load deer hunt to allow a few muzzleloader people hunt during the beginning of the deer rut. As proposed, it would include areas that are considered over the buck to doe ratio for those units. I question that reasoning. I am not against this proposed hunt, in fact if the units were closer to where I live and were not all private, I would be very interested in applying for it. Buck to doe ratios are usually determined AFTER all the other hunts have taken place and in my opinion are just wild guesses anyway. 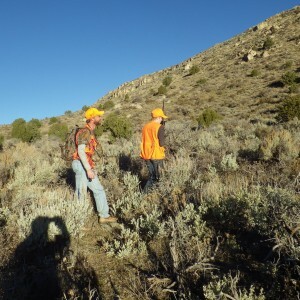 I would think you would get more buy in from the hunting masses of the state if you would just have a few tags available for each and every one of the 30 units of the state, or just leave out the units covered by the Wasatch Late archery areas and the late Crawford Mtn hunt, from this new LE hunt. My thoughts on opening it up are this: If there were a limited number of tags in every unit, say 3 to 10, that would put that much more money into the coffers. A few of the units would not have many bucks in them anyway because of migration at the proposed hunting date timeline and the harvest would be minimal. More tags would be offered in the 6 proposed areas because it is already felt there are more bucks in those units than desired and of course there would be a larger percentage of harvest in those units (more hunters afield = more bucks killed). 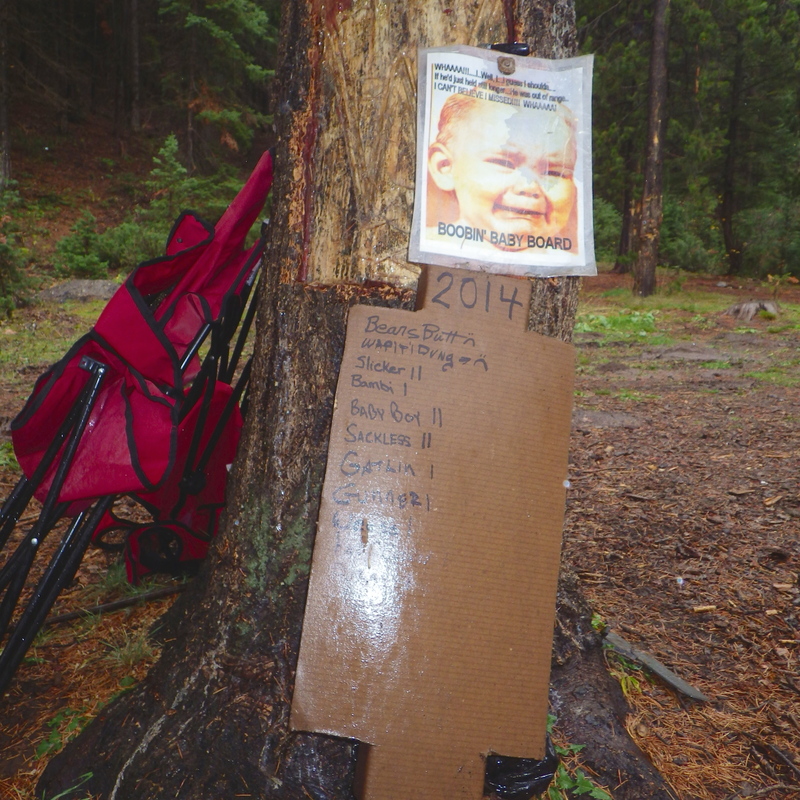 So, the bottom line is, offer more tags “state wide”, gain more money from the applications, gain more money from the available tags, have another set of happy tag holders and still not hurt the deer herds very much. I’d love to have a chance at a rutting buck in the Bear Lake area of the state or out on the Pilot Mountain range. I don’t know about the rest of the proposals, I guess they just didn’t seem to be very important to me at this time. You might want to read up on these for yourself and maybe attend the meetings or send them an email of your own. We have had a pound of ground elk meat in the fridge for a couple of days and I told Winemaker we needed to do something with it today. She suggested a “Hot Hamburger” supper…..YUMMY….I like hot hamburgers! So, you may or may not have heard of a hot hamburger meal, here is mine! I took the pound of ground elk (any kind of ground meat will work), I diced up 1/2 an onion and a whole medium green pepper (I picked mine fresh out of the garden…nice huh?) 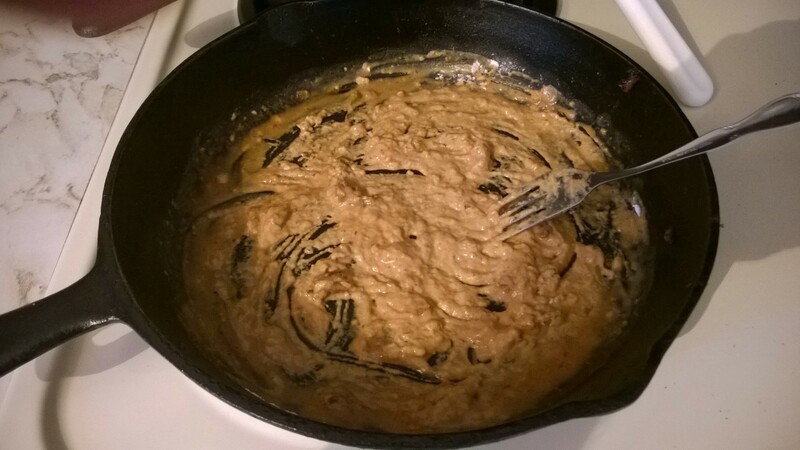 Added about 1/2 tsp season salt and a pinch of garlic pepper and mixed all that up with my hands! When you are mixing this sort of thing and you think you have it all mixed and ready…..do it again….mix it some more. 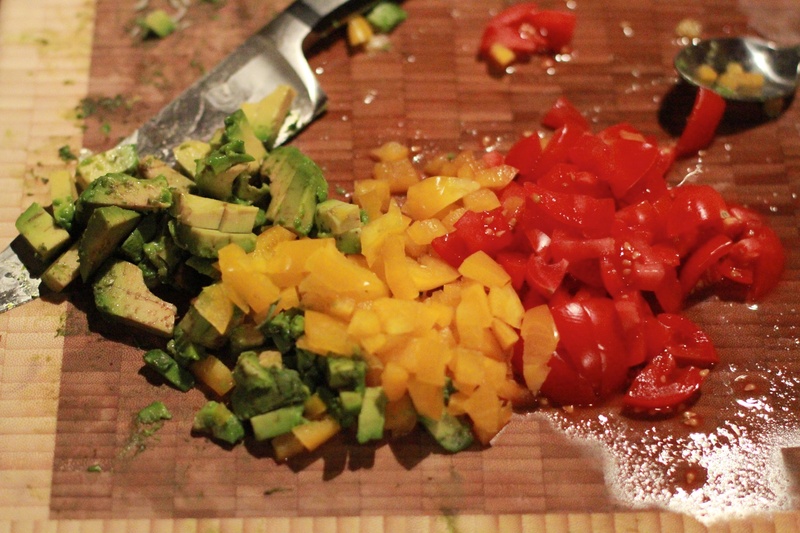 So, I’ll make 1/4 pound burgers with this mix….4 to be exact. Then I’ll fry it up and set the burgers to the side. Hot hamburgers are not just hamburgers that are hot….they are served on a piece of bread or toast and they have gravy poured over top of them….my mouth is watering….I must be like a Pavlonian Pup…..What’s that? Oh I guess I’ll have to tell you about Pavlov and his dog some time, or you can look it up on your own. 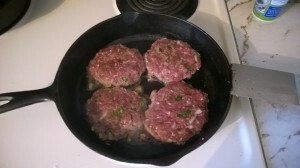 With the burgers all done and out of the pan, DO NOT toss out the stuff in the pan! This is what is going to make your gravy! Set the pan of “drippings” to the side and get some flour out of the cupboard. 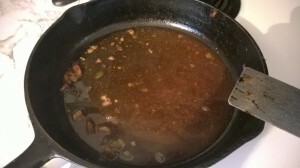 It doesn’t take much, maybe 1/4 cup, sprinkle it in the pan and stir it into the drippings. 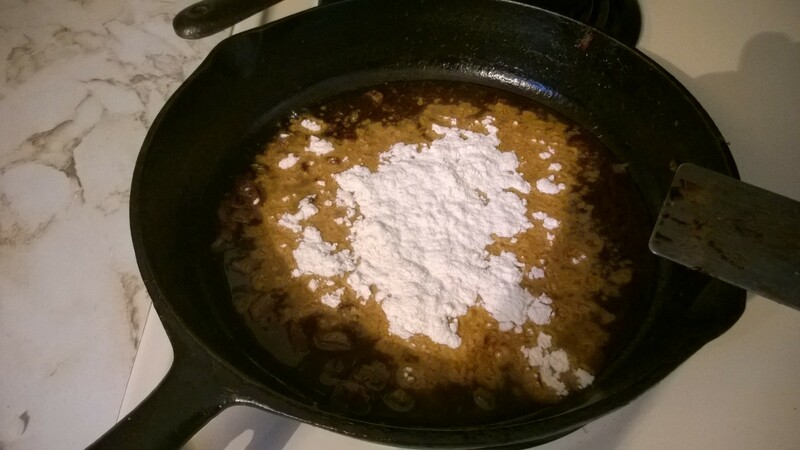 It will soak up the grease and pretty soon you will have nothing but flour coated with the pan drippings. Now you can choose to add, water or milk or a combination of both. One thing to keep in mind, milk will burn, so keep stirring it and take it off the heat as soon as it is thick enough for your liking. I usually begin with a 50/50 mix of milk and water, about 1 cup. I pour it into the flavored flour along with some salt (to taste) and begin to stir it up, I never stop stirring. Keep the heat LOW and it will eventually thicken up. When it is just the way you like it, pour it out of the pan and into another container that is good to put into the oven to keep hot. I like a little dish with a cover. 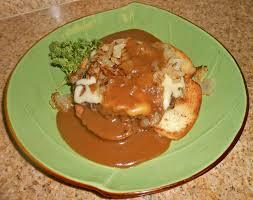 So, now you have your burgers and gravy all made. Pop a couple of slices of bread into the toaster and toast it up. If you are eating by yourself, only toast one slice. For this meal, make sure you have a date. Now on the cooking channels they are always telling you to make a veggie of some kind….I’m not really big on veggies…..I’m a meat and potatoes guy….Heck, didn’t I just put in onions and green peppers into the meat! That’s enough veggies! 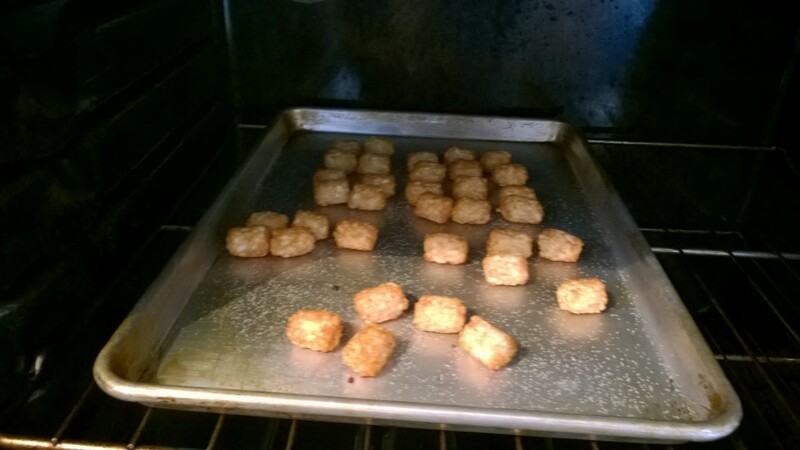 So, for my spuds, today I’m going to cook up some Tater Tots! They are easy, ready to heat and eat right out of the package! AND they are made with REAL potatoes! There you have it! 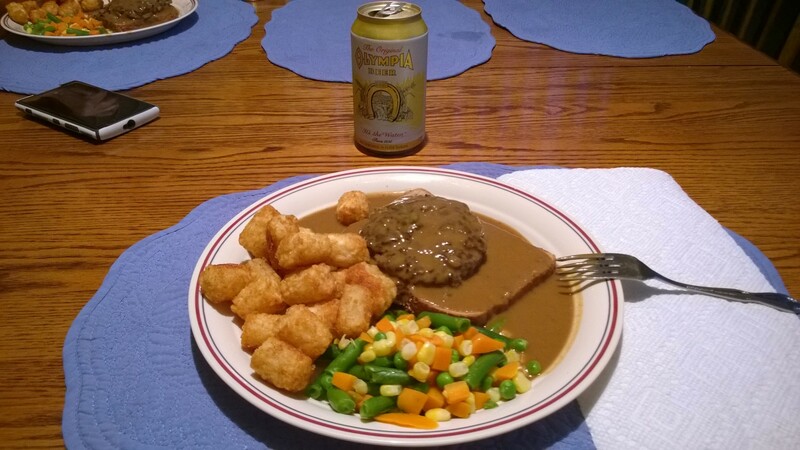 Put the burger on top of the toast, cover it with gravy, put some Tater Tots on the side and serve it up! Goes very well with beer! Winemaker insisted on mixed veggies for our meal. Some people like some ketchup and mustard….you decide on that! Mine? I’ll eat it plain and simple! 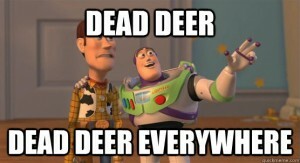 I just finished processing my third deer for this year. This one was taken by 13 year old, Braden Brailsford from Brigham City. A nice 3X2 with pretty good mass for a little buck. He was lucky enough to get a clean shot just before dark on the opening day and nailed it perfectly. There was only about 3 pounds of meat that was destroyed by the shock, not bad for a high caliber bullet. His parents were both extremely proud of him and they should be. He was pretty stoked too telling me the story. That is two bucks in two years for him! As I was processing it, it became very apparent this little buck had been eating very well. There was fat layered in all the muscle throughout the animal. I have never seen so much fat marbled in a deer. I suppose that is what happens when the buck eats nothing but alfalfa, corn and home grown veggies its whole life. So, I have processed 3 deer this year, all taken in Northern Utah and all three were fat as could be. Does that mean they had a good growing season with plenty of water and forage? Or is it Gods way of preparing them for the upcoming winter? If in fact it is the upcoming winter, I suggest everyone reading this pile in an extra cord of wood for the stove and maybe even fix up the snow blower or ATV snow plow, NOW and not wait until that first snow storm. Another thing I’ve noticed is all the fuzzy caterpillars crawling around….many more than usual. Another sign of a harsh winter? HMMMMM….. Extra cord of wood…..A new heavy duty coat…..snow blower fixed and ready…..extra gas in the gas can…..Or perhaps just jump in the jalopy and head down South! NAH! South is for sissies! Come March of 2015, we will be able to know what the fat and fuzzy caterpillars were trying to tell us….let’s learn a thing or two about this, as Nature tends to tell us stupid humans things that we sometimes don’t notice or if we do, we don’t take heed to. Maybe there is a need for a new pair of red flannel underwear in my future. 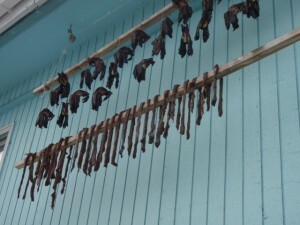 Making good tasting jerky is always a fun thing to do. I have my own recipe and have gotten really used to it. Recently, on Facebook, one of my friends posted up a picture of some of his home made jerky and he has allowed me to post his recipe up on here to share. Looking over the ingredients I can see it would be VERY HOT to my liking, but it can be toned down. This is the time to be posting up a recipe like this one as folks have either gone out and harvested their big game animals or are about to. Give it a try and post up how well you like it. Slice into 3/8-inch strips, be sure to cut with the grain. Combine ingredients in a small container (i use a zip lock bag) and stir or shake. Put the elk strips into the marinade, make sure the meat is totally covered. Allow meat to marinate overnight. To finish the elk jerky recipe, slay (lay) strips over a rack and bake at 150°F for 6-8 hours. You can also use a dehydrator for this elk jerky recipe rotating trays every 4 hours for 12 – 16 hours. Sprinkle red pepper flakes on before applying heat to dry. I use A LOT of red pepper!! !